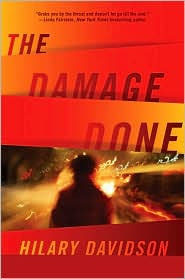 The Page 69 Test: "The Damage Done"
Hilary Davidson is a travel journalist and the author of eighteen nonfiction books. Her articles have appeared in more than 40 magazines, including Discover, Reader’s Digest, and Martha Stewart Weddings. Her short fiction has been widely praised and included in anthologies such as A Prisoner of Memory & 24 of the Year’s Finest Crime & Mystery Stories and Thuglit Presents: Blood, Guts, & Whiskey. Originally from Toronto, she now lives in New York City. How much can one page of a novel tell you about a book? Quite a lot, it turns out. Page 69 of The Damage Done offers a snapshot of the relationships in the book. On the pages just before it, the main character, Lily Moore, was mistaken for her missing sister, Claudia; she was attacked as a result. The woman who assaulted her is a dead-ringer for Claudia, right down to the tattoo on her shoulder. The woman is also romantically involved with Tariq, Claudia’s ex. Tariq has set up a strange romantic triangle: at one point is the woman he really wants but can’t have; at the other is the woman he has but doesn’t really care for. Lily is creeped out by seeing what appears to be a substitute for her sister, and she can’t help but worry about what it says about the state of Claudia’s relationship with Tariq. “That’s not fair. Claudia hasn’t asked me for anything this time. She probably doesn’t even know I’m in New York.” It was one thing for me to criticize Claudia, but I hated to hear anyone else do it, even Jesse. It was a holdover from childhood, when my sister wouldn’t go to sleep at night unless I got rid of the monsters under her bed. She was convinced that I was the only person who could do it. I’d always been flattered by her belief in me and willing to banish monsters wherever she saw them. But now, the job had gotten too big for me. I wondered if I really had damaged [the woman’s] nose. I hoped I had and immediately felt rotten to the core. That was the kind of thing Claudia would say, not me. As Lily continues to search for Claudia, she’s forced to confront her own dark impulses. Page 69 is just the beginning.